Violin and viola teacher, what's the difference? I think violin and viola teacher have a very similar job and here I'll tell you what I think the similarities and the differences are. In teaching I follow what I've learned from Kató Havas, which is all about how to use our body to prevent or eliminate physical tension which causes physical problems like pain, tendinitis etc., makes playing much harder and creates mental tension, stage fright. Just to briefly give you some information, Kató Havas was a child prodigy with the violin. 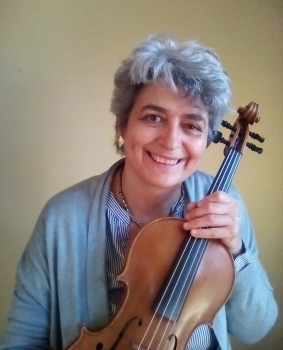 Then, over nearly fifty years she developed what she called the "New Approach" to violin (and viola) playing, focused on the correct use of the body when playing. It's not just about the fingers involved in playing, it's all the upper part of the body. She wrote several books on this subject, I very warmly recommend them, they are very good books for any violin and viola teacher, if you want to read more. I read them after reading many other books about string playing and teaching. I also translated three books of hers into Italian, which you can see here, met her and attended several workshops in Italy, so eventually I decided to teach this way and I teach both violin and viola. By focusing on the correct use of the body, rather than on the instrument, there is not much difference between violin and viola teaching, because the two instruments are played nearly in the same way and the basics of playing are the same. There are differences when the players are more advanced, about tone production especially for the viola, about fingerings and about repertoire. Of course, the viola teacher will know the viola repertoire much better than the violin teacher and vice versa, and can give advice to their student as what to choose. Anyway, violin and viola teachers have to be music teacher in a broad sense, teaching the students much more than just placing the fingers on the fingerboard. I tell my students to understand the meaning of the music, what the composer meant to say and many other things related to his music. I think a violin and viola teacher should teach what the student wants to learn. When I have a new student, at the first lesson I ask him or her to play whatever they have prepared and then ask them what they would like to improve in their playing and then we work on that. This because the student's opinion on what he/she needs may be very different from mine, and it's important to address what the students consider a problem, so they can see they are improving. Also I ask them what sort of music they'd like to play, what pieces, what is their purpose in playing. Everybody is different. Some want to take exams, others want to play just for fun, some want to play on their own, others want to do chamber music, join an orchestra, others want to do folk music or learn how to play by ear. I'd never tell a student who wants to learn to play by ear and join a fiddle band, "No, you have to take grades!" They'd hate me. Also I wouldn't teach folk music to a student who wants to prepare pieces for an exam. Now I teach the new approach and I see that my pupils have a nice tone from the very beginning, the advanced ones improve very quickly, all enjoy themselves much more, learn more quickly and overcome nerves. I play folk music too and I sometimes get students who want to learn some tunes and join a group but don't want to learn to read. I never force anyone to learn to read. At the same time I explain them that by reading they would be able to learn and play many more tunes more quickly. Eventually, some change their mind and want to learn to read. At lessons, I always bring my viola with me, I always play something with the student, even if it's the very first lesson for a violin or viola student. This way from the beginning I want them to get used to hear and play with another player, listening, learning the importance of a steady rhythm and pace. The student feels he/she can play some real music, not just open strings. If my student plays viola, we can make a nice viola duo. If the student plays violin, this would an opportunity to hear the viola and play with a viola player. On the other hand, if I have to demonstrate something, I always use the student's instrument. This is because for many students is very easy to complain about the quality of their instruments when they are not happy with their tone, while they should be aware that what counts, more than the instrument, it's the way they play it. I show them that by releasing all the tensions in their shoulders, arms, hands, by not gripping the instrument and the bow they can produce a nice tone. And this applies also to the very beginners, it's not true that they (and their family and neighbours) have to suffer months and months of horrible screeching. Finally, no matter what you are, violin and viola teacher, student or player, I'd like to recommend you to watch some videos of a workshop with Kato Havas to learn to play without tension, with practical exercises. I want to make sure that my students play because because they love it, not because somebody else tells them to do it. In case you are thinking of learning to play violin or viola or you already play and are looking for a violin or viola teacher, consider that it's not only about playing all the right notes or passing exams, it's a very special way to communicate with people. You need to really want to say something, tell them a story and enjoy this communication and make them enjoy it as well. Playing violin, viola or any instruments requires commitment and dedication, it doesn't happen in one week, but it's worth the effort many times. So, happy playing! And call 07985 025129 or send a message. What do Hilary Hahn, Julian Lloyd Webber and Maxim Vengerov have in common?